Critical Challenge: Are Collectivism and Individualism Opposites? Are Collectivism and Individualism Opposites? Create a visual representation that accurately illustrates the relationships among individualism, collectivism and the common good. Students assess the extent to which individualism and collectivism promote the common good by deciding how best to represent, visually, the relationships between these concepts based on an examination of various individual and collective actions. Introduce the concept of common good by presenting a short reading from a news story describing an act of philanthropy or government initiative benefiting the common good (see References). Guide students in a discussion about what may have motivated the act: a concern for the interests of a group of people or a concern for how the philanthropist might benefit. Give an example of how an individual action could benefit the common good. Give an example of how a collective action could benefit the common good. What are the characteristics of a person who primarily values individualism? What are the characteristics of a person who primarily values collectivism? Give examples from your community of individual/collective actions that promoted the common good. Invite students to consider the degree to which the principles/values of individualism oppose the principles/values of collectivism and the degree to which, if any, they share common ideals. Offer students examples of actions that reflect collectivist or individualist principles (30-1) or values (30-2). requiring conscription or compulsory military service in Canada. After students complete the ranking process, ask them to share and discuss the placement of each of the actions. Develop common understandings for each concept. Following this discussion, invite students to make changes to their rankings to reflect new understandings of the concepts. Direct students to create a Venn diagram that accurately illustrates the relationships among individualism, collectivism and the common good (see diagram below). 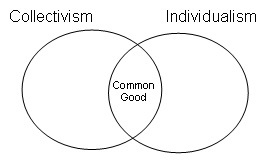 For example, if an action clearly reflects the principles or values of individualism and does not appear to support the common good, it would be placed on the right side of the diagram. In addition, or alternatively, students could write statements summarizing the relationships. For additional information, see Venn Diagrams (Support Material). Invite students to create a visual response to the question “To what extent do individualism and collectivism both contribute to the common good?” Responses could take the form of a poster, illustrated continuum or graphic story. comprehensive: accurately represents their interpretation of the relationship among individualism, collectivism and common good. You may want to refer to the criteria and guidelines for effective visual presentations found in Creating Persuasive and Effective Visuals (Modelling the Tools). In addition, you may want to refer to Justifying My Choice (Support Material) to help students present ideas and consider other perspectives.